The Ocean Space Habitat in action. National Geographic photo. Initially conceived as a kind of "base camp" for SCUBA divers, the Ocean Space Habitat is being touted as ushering in a new era of underwater exploration. While underwater habitats aren't a new concept (see NOAA's Aquarius), the degree of flexibility afforded by the Ocean Space Habitat promises to allow broader usage and new applications. How does it actually work, though? 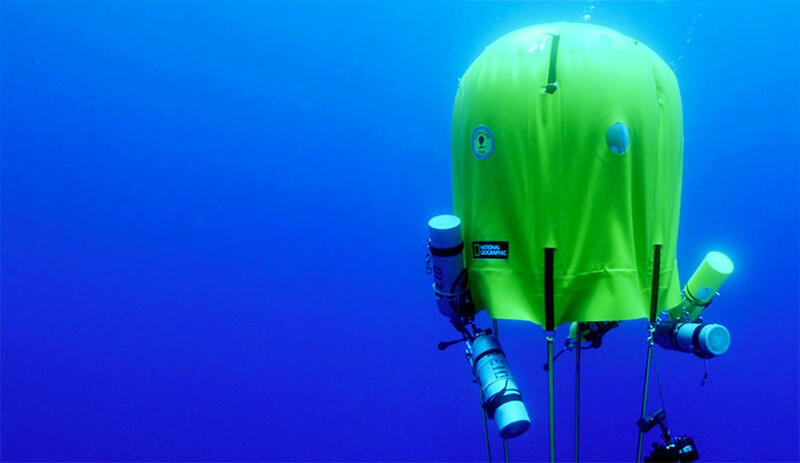 Essentially, the structure is packable, allowing divers to bring it to their desired underwater location, inflate it, and use it as a basecamp. Divers can remove their gear, eat, nap, and work far below the surface without relying on a cumbersome vehicle or needing to resurface. The tent can then be dissembled and moved to a new location, allowing divers an unprecedented degree of freedom in terms of time and movement underwater. Instead of being restricted to the amount of oxygen which they can carry on their back, divers utilizing the Ocean Space Habitat can conserve oxygen by using the tanks attached to the habitat. This is such a cool idea, i want to try this someday. Interesting, but I feel the idea should be developed more. There is definitely great potential in it.